A new quote for the anthology! "This compilation of the dark and macabre has twists that kept me turning the pages long after I should have gone to bed. Fun and mysterious, wicked and sometimes disturbing, take a deep breath before you begin. You won't be able to catch another one until the brilliant and thrilling conclusion." Labels: "Darynda Jones" "All Things Dark and Dastardly"
All Things Dark and Dastardly Available Now! Looking for the perfect set of stories for Halloween? Need a good thrill? 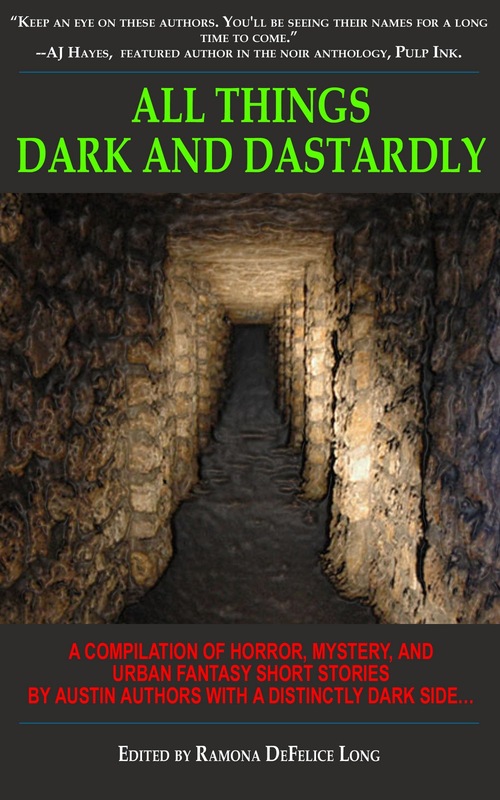 All Things Dark and Dastardly is on sale today at Amazon, Smashwords, and Untreed Reads. Published by Dragonfire Press, this book is a compilation of horror, mystery, and urban fantasy short stories by Austin authors with a distinctly dark side. Kaye George is an Agatha nominated short story writer and the author of the gritty novel, Choke. Steven E. Metze wrote The Zombie Monologues, as well as, numerous role playing game and miniature war game rule books and sourcebooks. Mary Ann Loesch is the author of Nephilim, an award winning urban fantasy. Together they've created an anthology that provides thrills and chills, along with a little food for thought. To purchase your copy of All Things Dark and Dastardly, check out the following links! All Things Dark and Dastardly Release Date! It's official! The anthology All Things Dark and Dastardly will be released on Oct. 21, 2011 by Dragon Fire Press. This book is comprised of dark stories from award winning writers Kaye George, Steve E. Metze, and Mary Ann Loesch. Here's just a few things people are already saying about the book! "Keep an eye on these authors. You'll be seeing their names for a long time to come." AJ Hayes, featured author in the noir anothology, Pulp Ink. "A string of sizzling stores to stimulate your senses and excite the nerves, especially when night falls." Edith Y.S. Harris, Artist and short story writer, www.eyshasfineart.co.uk. Available in paperback and in ereader formats at Amazon on Oct. 21! Looking for the perfect set of dark stories to curl up with this Halloween? Look no further than the pages of the upcoming anthology All Things Dark and Dastardly. Comprised of 13 stories sure to drag you into the depths of the macabre spirit, the Dark and Dastardly collection is written by the award winning writing team of the successful All Things Writing Blog. Fingers in soup cans, fat guys and aliens, swampy creatures, and all things that might murder you in the night--All Things Dark and Dastardly is sure to keep you awake at night!